Need a new Christmas tree skirt? This crocheted tree skirt may be just what you are looking for. 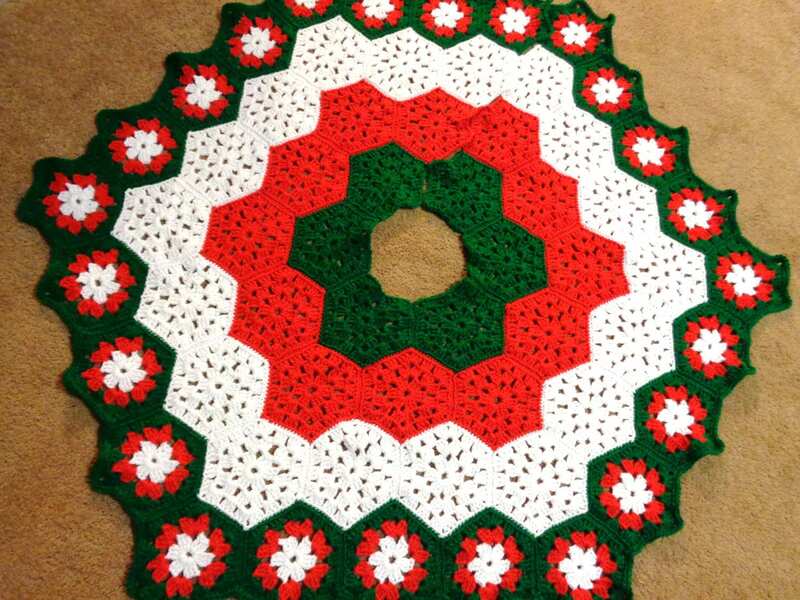 It is crocheted from green, red and white hexagons. The outer edge is a combination of all three colors to make for a stunning effect. This tree skirt will last for years and become as well known as the ornaments that are on the tree. It is crocheted from acrylic yarn. It is machine washable and dryable. It is 49 inches wide at it's widest point and 43 inches at the smallest point. I can make this tree skirt in any color, so if you have a tree skirt that you would like made to match your decor, please send me a message. Please note that the colors on your monitor may appear different than the actual tree skirt.